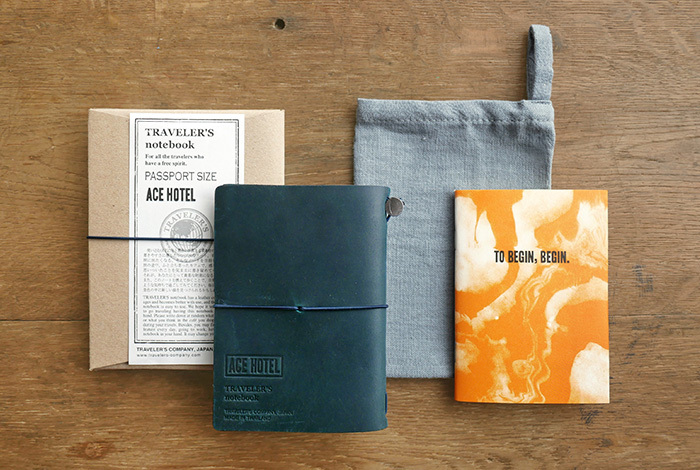 The 4th collaboration between Ace Hotel and TRAVELER’S COMPANY! With space design that reflects the history and culture of each city, warm hospitality from its staff and a style that combines a unique and highly curated cultural experience with comforting familiarity, Ace Hotel is a favorite among travelers around the world, particularly creative types who are brimming with curiosity. The chain was thrust into the public eye in Japan after a new Ace Hotel was slated to be opened in Kyoto in 2020. 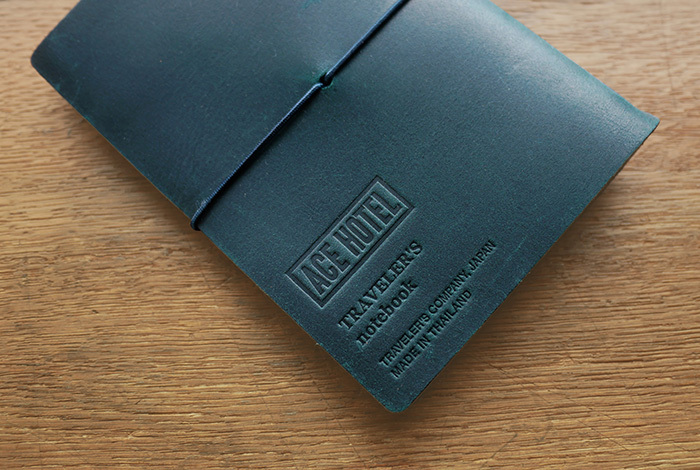 And so began collaborations between TRAVELER’S COMPANY and Ace Hotel. TRAVELER’S COMPANY and Ace Hotel have collaborated since 2015, and are about to embark on a fourth project together. 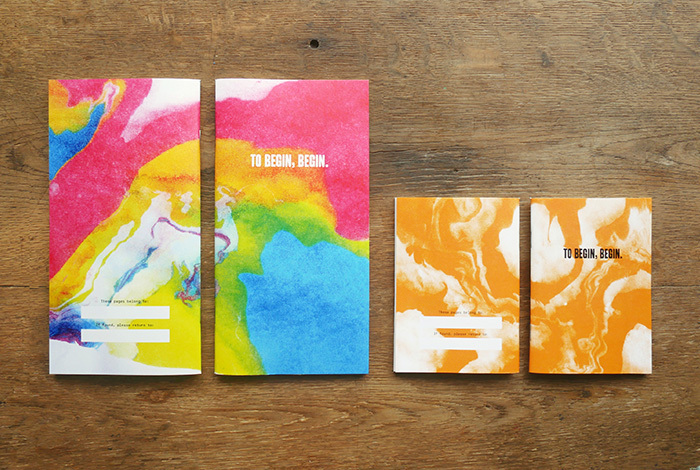 A special version of our blue passport-sized TRAVELER’S notebook will be released for travelers from around the world. We’ve also created special refills for the regular size and passport size. The graphics printed on the covers of the refills have been designed by Atelier Ace and modeled on the traditional marble pattern that has been a long-standing favorite among notebook users from kids to artists. Serving as a title are the words “To Begin, Begin”, a quote from the poet William Wordsworth that is a core principle of Atelier Ace. This quote is a simple reminder to just start, and expresses our hope that users will take all that curiosity inside them and unleash it on the blank pages of their notebook. New stickers will also be released, featuring iconic artwork from Ace Hotels in 8 American cities and London. These collaborative items will be successively released in Ace Hotel stores from December. 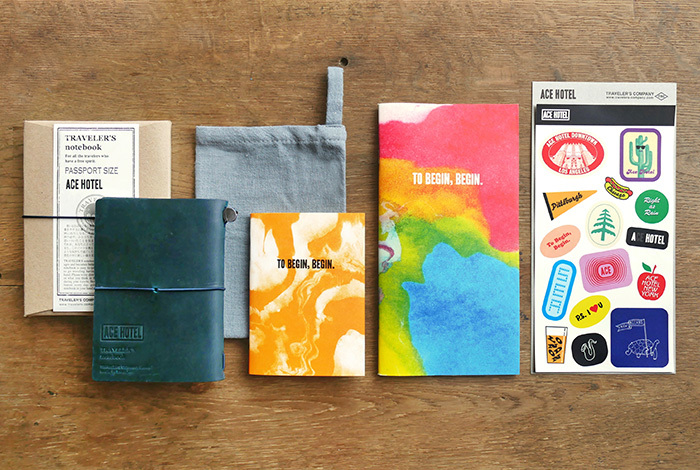 A leather cover with the logo of Ace Hotel pressed on the back, and collaboration refill is set together. This time, Passport Size Blue will be newly released. We made this with the hope that travelers can use this as a backpack in which they can store their travel memories. The graphics printed on the covers of the refills have been designed by Atelier Ace and modeled on the traditional marble pattern that has been a long-standing favorite among notebook users from kids to artists. Serving as a title are the words “To Begin, Begin”, a quote from the poet William Wordsworth that is a core principle of Atelier Ace. 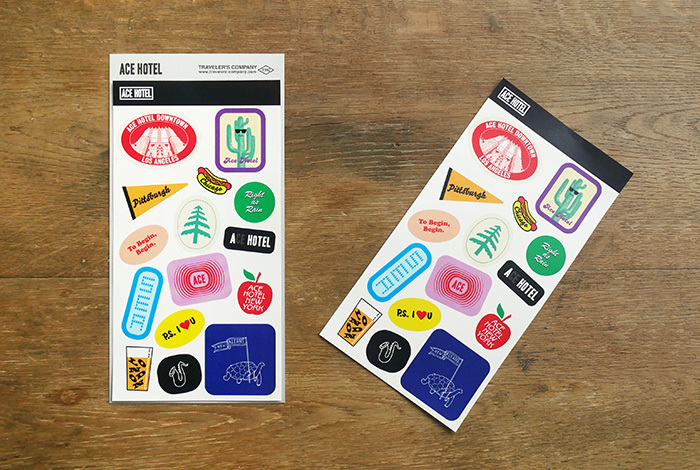 Stickers are featuring iconic artwork from Ace Hotels in 8 American cities and London. In Japan, Ace Hotel collaboration items will be sold in TRAVELER’S FACTORY™ Nakameguro, TRAVELER’S FACTORY™ AIRPORT(Narita Airport), TRAVELER’S FACTORY™ STATION(Tokyo Station),and TRAVELER’S FACTORY™ ONLINE SHOP on December 12, 2018.